How Can *ANYONE* Take This Channel Seriously? So, apparently, six years of war hasn't accomplished any learning. They don't follow the rule: "War is God's way of teaching Americans geography." 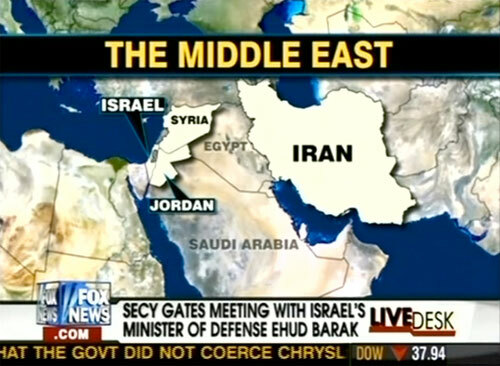 BTW, if you *don't* get it, Egypt is the country right above the Fox News logo on the lower left. The country marked "Egypt" on the map is *not* Egypt. If you *don't* know what country it is, PLEASE don't ask *me* (unless you want to be personally listed here in this blog with your *REAL* name). My brother is excluded from that last item, BTW, since I know his short-term memory issues. This page contains a single entry by writch published on September 16, 2009 5:36 PM. The Seven Most Inappropriate Products For Children was the previous entry in this blog. Mary Travers of Peter, Paul and Mary dead at 72 is the next entry in this blog.